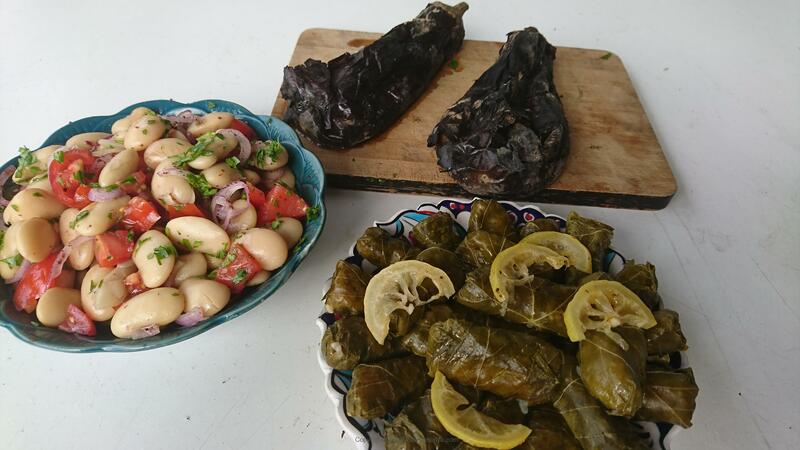 Granted – I’m not the very convinced fan of Yaprak sarma – stuffed wine leaves. It’s probably just because we rarely get them and that I’ve never really been used to them. I have always thought they were a little strange and that the leaves could often be a bit chewy and bitter. But it can vary a lot from place to place. 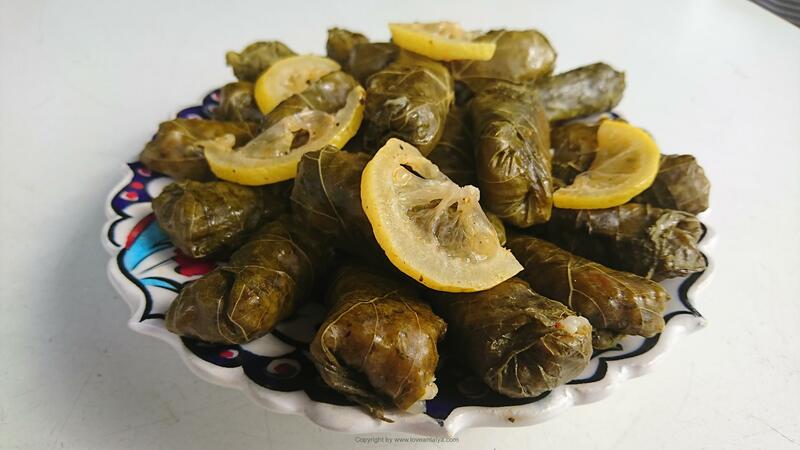 Sarma is something that is considered really Turkish. And a lot of people I know – even non-Turkish people, eat the stuffed wine-rolls with great pleasure. So last time my mother-in-law spend a couple of days with us, I lured her to make them. I have never even tried to make stuffed wine leaves. In my world, it’s very difficult to make Sarma, but in reality, it’s not much more cumbersome, than so many other dishes. 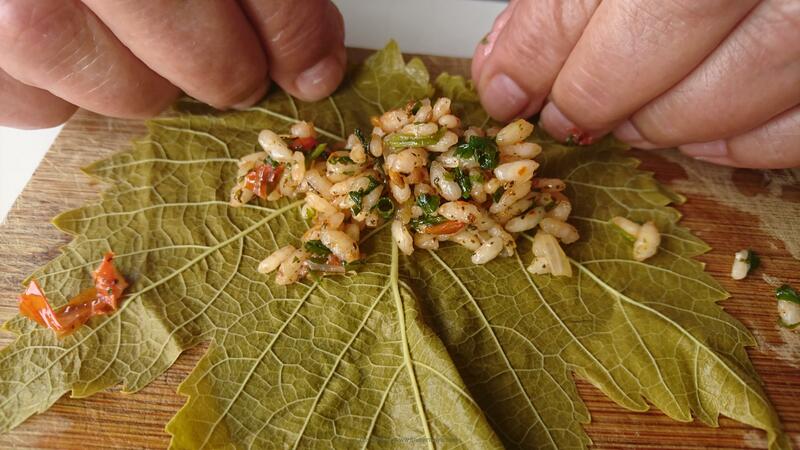 Yes, of course, they take some time and there are several processes in the production – cook the leaves (unless you have bought them on glass), make the filling, roll them and finally boil them. But it’s actually a very nice and relaxing job. So we had a nice afternoon with sunshine and cooking on the terrace, while she showed me the method and technique of making Sarma, and I was allowed to just observe, write down and take pictures. However, it took a bit of persuasion to be allowed to take pictures, because I had to promise her solemnly not to post a picture of her on the blog. I would ne more than happy to do so, now when she is the “mastermind” and cook behind these beautiful rolls (which I actually like). But only a picture of her hands could even be given permission. “Sarma” and “Dolma” have a lot in common. 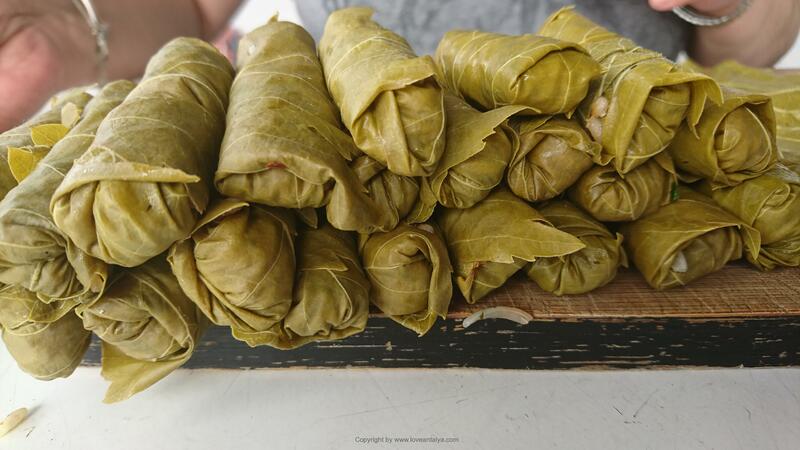 “Sarma” means directly translated “wrapped” things and “dolma” means “stuffed” things. If you are a real Turk, you can stuff almost anything – squash, aubergines, onions, tomatoes, peppers, mussels, squid, etc. etc. For example, you can see my recipe for stuffed peppers here (it actually originates from my mother-in-law). 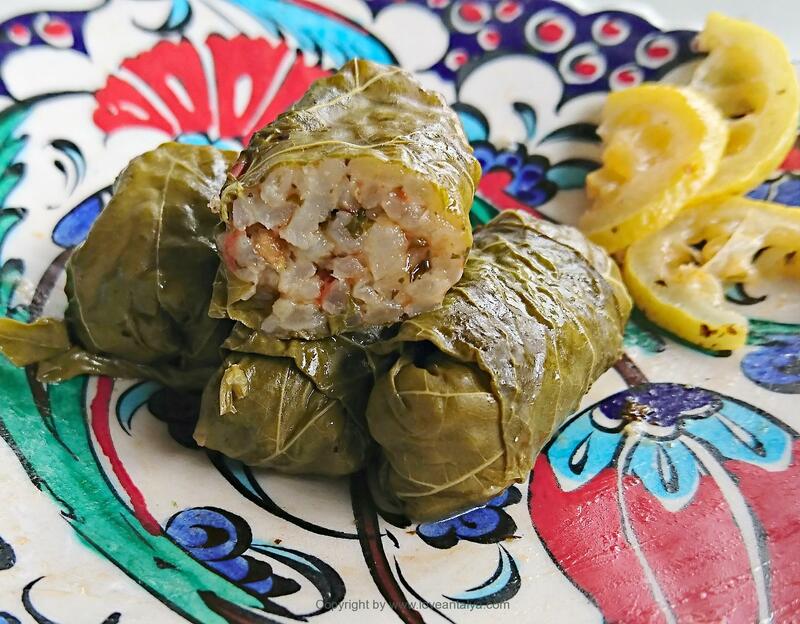 Wine leaves and cabbage leaves are most commonly used for sarma in the regions around the Aegean and the Mediterranean sea, while other cabbage shapes and leaves are used in the areas around the Black Sea. Not everyone is as lucky as I and just can go out in the garden and pick up wine leaves, when they are brand new, fresh and very fine. But they can also be purchased from most ethnic green grocers on glass or vacuum-packed, where they are pre-prepared and ready for use. If you have the opportunity to find fresh leaves, do it. 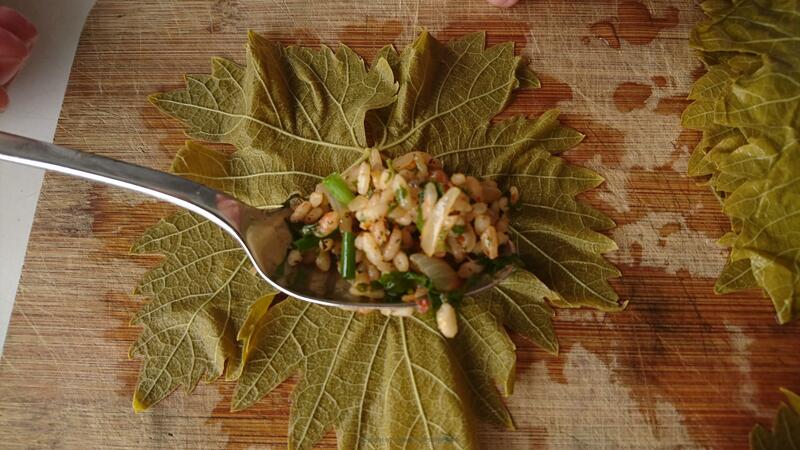 All wine leaves can be used – it does not require a particular type. It’s just important that the leaves are not too old, ie have been sitting on the stick for too long, so they have become powerful and filled with “veins”. You have to grab the nice light green kinds, the newest ones (though they should not be very small and thin as they is very hard to roll and also often breaks during cooking). 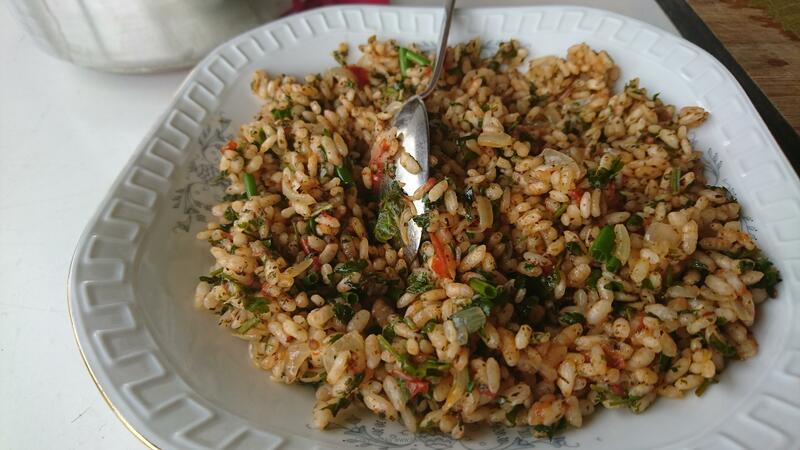 I think it’s a bit fun with wine leaves, that they get a rather sour taste, when cooked. It’s really not that bad. 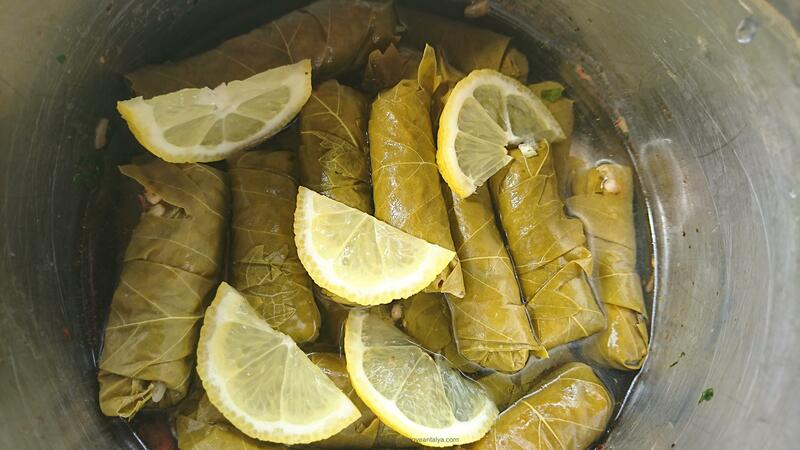 Of course, you also add a few slices of lemon when boiling, but the stuffed wine leaves still have a slightly different fresh taste than an ordinary lemon. As mentioned, the rolls are really good as part of Meze appetizers, but we also use them for a light lunch or as a supplement to dinner. I hope you want to try them. Even though they may be a little different than what you usually eat. Who knows – maybe they will become your new favorites. ½ tsp chili, "pul biber"
1: fry onion and tomato completely soft and until they get a good color. 4: Add ½ cup of water, let it boil and turn down again. 5: Let it simmer for about 20 minutes and then cool off. Cook the wine leaves in the meantime. 3: Carefully roll the blades tightly around the filling. They must be oblong and approx. correspond to a small finger in thickness. Do so with the rest of the wine leaves and stuffing (save some leaves for the cooking). 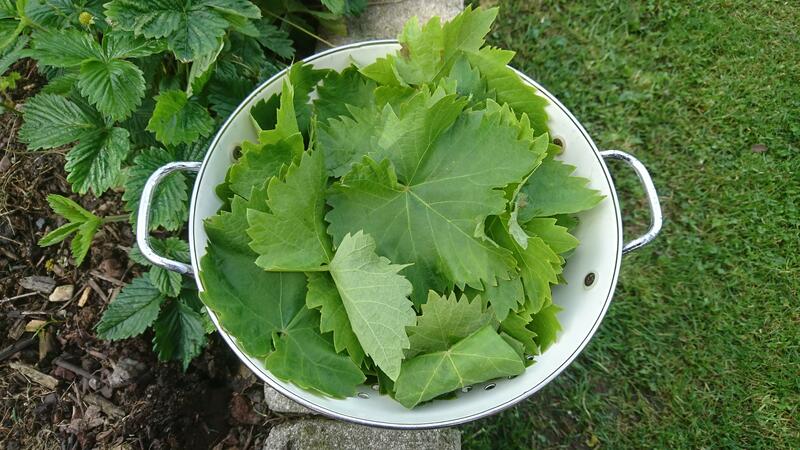 4: Add about 10 leaves - or how many you have left and depending on the size, at the bottom of a saucepan. This is so the rolls do not burn. 5: Carefully lay the rolls in the pan with the closure downwards and add some thin lemon slices. 6: come about 1½ cups of water inn. The rolls should not be covered with water - only about 3/4 up. 7: Put a small plate over the rolls down in the pan so that there is some pressure on them. 8: They must simmer at mid-tempeture for about 30 minutes. It is important that they do not boil as the rollers will loosen. 9: Remove them from the cooker and let them cool in the pan. 10: Take them up and let them drip off. Put them on a dish and decorate with lemon slices.